Are you looking for a classic Cambridge condo in a central location? You’ll want to check out the condo just listed for sale at 41 Bowdoin Street in Cambridge MA, Unit 44. 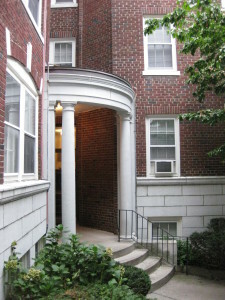 41 Bowdoin Street is a Harlow building built in 1920. It’s a fanstastic location – a quiet side street lined with beautiful houses close to Mass Avenue and offering easy access to Porter Square and Harvard Square. The lovely architectural features of these classic brick buildings are evident from the Arts & Craft tiling in the entry downstairs, to the high ceilings, numerous windows, and fireplace in Unit 44. Unit 44 is a spacious one bedroom condo with a study. The living room is generously sized and so is the bedroom. One surprising feature of Harlow buildings is the wealth of closets. Here you’ll find two closets in the bedroom, a decent sized closet in the study, a linen closet, and a surprisingly large closet at the entry. The kitchen has a gas stove and a compact dishwasher. Open shelving over the sink will keep your favorite dishes within arm’s reach. The bathroom has been updated with a pedestal sink but retains its original subway tiling. On the 4th floor you get tree top views and great light. Unit 44 is exceptionally bright with a skylight in the hall. Downstairs there is an additional storage unit, common laundry, and bike storage. 41 Bowdoin Street Cambridge is a 35-unit building. The association is pet friendly. 41 Bowdoin Street Cambridge MA Unit 44 is new to the market and listed at $395,000. For more information or to schedule a showing please call Liz Bolton – that’s me! -of ReMax Destiny at 617-504-1737 or send me an email.